When buying a step in bath you will want to consider the height of the step in. Some models and brands are going to have varying step in heights. Many of the models available will have a step in around 7” which is the same height as a regular step on a stairway. For many people this is low enough, however for some an even lower step in height is required. It is very important to understand however that step in baths aren’t the right solution for everybody. 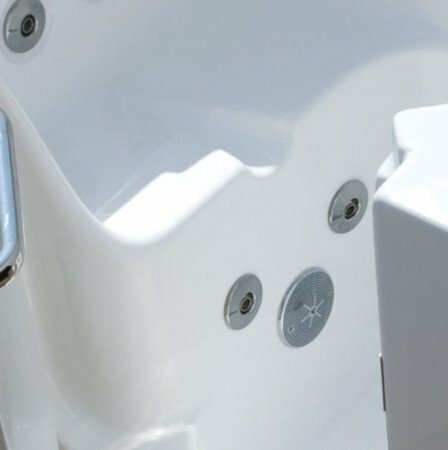 If the bather can’t walk up a couple stairs or stand independently, you will want to consider one of our caretaker tubs that have a transfer seat built right into it. These types of transfer tubs don’t require the bather to step up in, but they can simply sit down on the seat and swivel their legs and feet inside the tub. No matter what kind of step in baths you’re looking for, Aging Safely has numerous options for your handicap bathroom. This 32” x 60” model is one of our larger models that has extra space for bathing comfortably, yet still has a very low step in height. Where Can Step In Baths Be Installed? Our step in baths can be installed into almost all residential homes or even commercial facilities. These unique handicap bathtubs require plumbing hookup like a regular bathtub or shower, but also may require electrical power supply to run the jets and other accessories. Other than that, making sure there is enough space in the wet area is crucial. Not only do you want enough space to actually install the step in bathtub, but you will want to make sure there is enough room in front of it as well. This is important because the bather will want ample space when getting out to sit down or get into a wheelchair. One of the most important parts to buying a new walk in tub is making sure the manufacturer installation guidelines are being followed. Installing a walk in tub incorrectly can result in losing the full manufacturer warranty. We sell walk in baths fully installed and always install them according to manufacturer recommendations. We also sell supply only walk in tubs to homeowners and contractors alike. When doing it yourself, it is vital to utilize a licensed plumber that will follow all manufacturer guidelines for your new step in bath model. Please contact an Aging Safely Senior Bath Representative today to see which option is right for you.